From left to right, Kurt Baxla – Baxla Tractor Sales; Whitney Gentry- Foundation Director, Ron Ratliff, Norma Kirby, Shirley Pettit – FCMH Foundation board members, Steph Campbell – FCMH Foundation Coordinator, Steve Mossbarger, Connie Beford – Beford Ford Lincoln. Steve Mossbarger of Washington Court House had the winning ticket in the Fayette County Memorial Hospital (FCMH) Foundation’s Super Summer Raffle. He won a 48” zero-turn, eXmark brand mower. Raffle tickets were sold for the last month and Mossbarger’s name was drawn Saturday evening at Fayette County’s Toast to Summer & Hot Air Balloon Glow at the Fayette County Airport. The mower was made possible through the support of Baxla Tractor Sales and Beford Ford Lincoln, who sponsored the raffle. “We would be remiss if we didn’t also thank the Fayette County Chamber of Commerce, Fayette County Pilots & Friends and the Fayette County Travel & Tourism for allowing us to draw the winner at the Toast to Summer. We appreciate their hospitality,” said Gentry. Funds from the raffle will be used by the FCMH Foundation to support the hospital. The FCMH Foundation is a 501(c)3, established to not only ensure the hospital continues to provide premier care to patients, but that it has the resources to continue to expand on that care and capitalize on new advancements in medical care technology. The Foundation uses donations to support the hospital in enhancing patient care services, providing state-of-the-art equipment, contributing to expansion and renovation projects, supporting the development of community programs that will improve the health and well-being of people in the communities served by FCMH, and advancing healthcare education for the community. 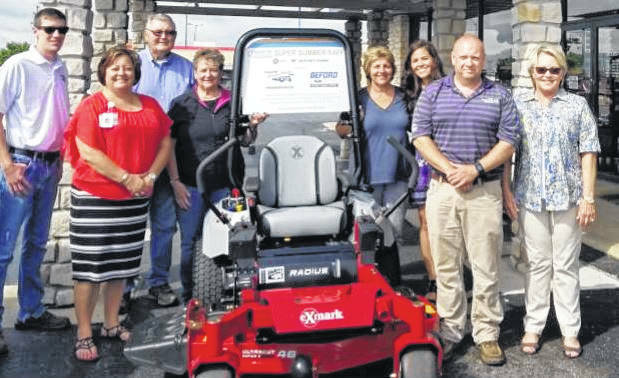 https://www.recordherald.com/wp-content/uploads/sites/27/2018/06/web1_FCMH.jpgFrom left to right, Kurt Baxla – Baxla Tractor Sales; Whitney Gentry- Foundation Director, Ron Ratliff, Norma Kirby, Shirley Pettit – FCMH Foundation board members, Steph Campbell – FCMH Foundation Coordinator, Steve Mossbarger, Connie Beford – Beford Ford Lincoln.